1 Initialization: Verify that one or more cells are not short-circuit, and then the battery is able to be recharged / restored. 2 Soft Charge: it performs a soft pulse charging algorithm dedicated to recharge deeply discharged batteries. 3 Bulk Charge: the charger enters phase 3, which provides full current to the battery until it is fully charged. 4 Maintenance: thanks to a specially designed electronic circuit, the charger maintains the battery when not in use without overheating, overload and loss of water and / or electrolyte. Protectionagainst short circuit, even permanent: no sparks! Laboratory tests ensure the manufacturing of products in accordance with local regulations relating to safety and EMC. Reference standards: EN55014-1, EN55014-2, EN60335-1, EN60335-2-29, EN 61000-3-2, EN61000-3-3. 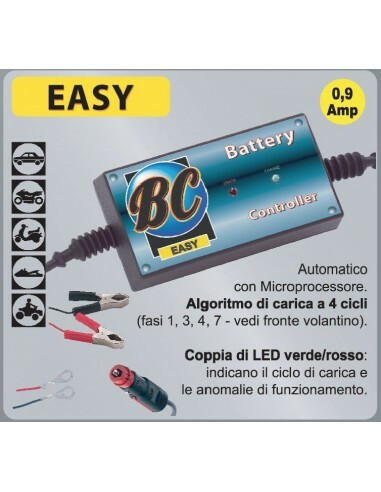 BC EASY 900 is designed for the maintenance of all 12V lead-acid batteries on the market (traditional, MF, AGM, GEL, VRLA, etc). 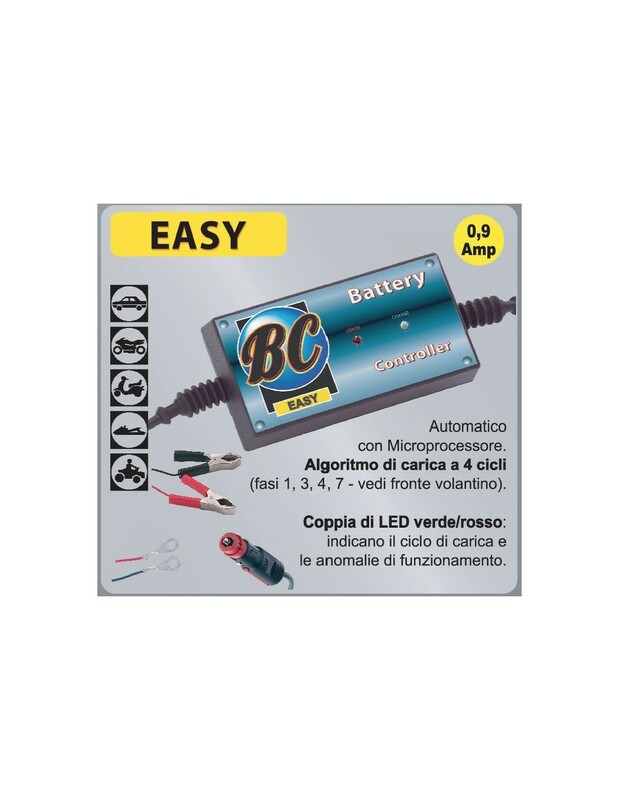 The product is indicated for charging batteries with a capacity of 1.2 to 45 Ah, and for maintaining batteries up to 60 Ah.